Compressor monitoring device helps user to get get maximum efficiency from existing compressor. 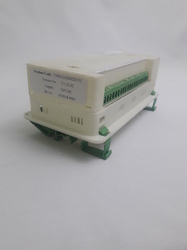 Compresosr monitoring device has provision to connect pressure sensor, Temparerture sensor, VFD , door sensor, trip input , running input. All real time data from sensor and drive send to server , our server application make scritical calculation to provide predictive maintenance report . Use can configure SMS , e-mail alert against critical situation, so that mainrtenance person can attend problem on time before break down. On web server application user can moniotor upto 5000 compressor units from single window.